As a result of this talk I recently posted on Instagram about the remedy Mustard which has the keywords : Black depression;melancholia;gloom. I thought I would write a little bit more about the state. The Mustard state of mind is a black depression, almost a hopeless, despairing melancholia which may suddenly close down on an individual without any apparent reason.It may lift as suddenly as it comes, but while it lasts, it envelops the person like a black cloud that shuts out all the pleasure and joy in life. The cause of the Melancholia in Mustard is never know. 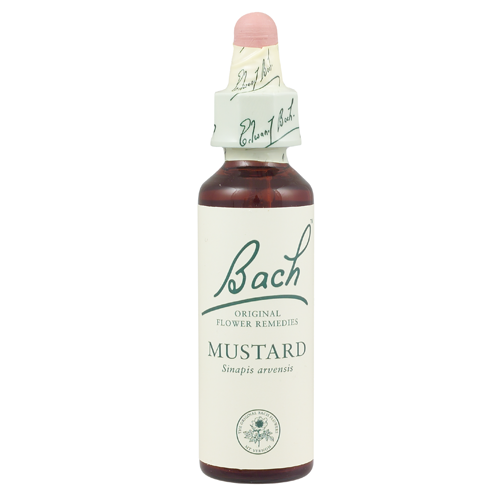 I have a regular supply of Mustard Remedy Bottles in my office which clients often buy from me separately. I find that it’s not always needed in a Remedy mix but clients who have suffered from depression know how to recognise it and this remedy helps them to quite literally ” nip it the bud” . I have used some Case Studies from Dr Bach’s notes so as to not be publicly discussing any of my current Clients. A case study from the 1930s tells us about an unmarried 21 year old woman who was subject to these causes of depression After two months of taking the remedy she wrote back to Dr Bach to say that she felt as if a cloud had lifted from her mind and she felt really happy. Dr Bach gives a variey of case studies of people from all walks of life and all ages. His point being, that everyone and anyone can suffer from Depression. However whether you choose to be like the middle aged man who refused to have blind faith in something he knows nothing about or if you are already using Mustard, then I wish you well on your journey. If you are suffering from depression or feeling unwell please seek help now. Contact your GP or at least talk to someone about how you are feeling. You are not alone and help is available.